I have just returned from a little vacation down South visiting family. It was so nice to unplug for a few days and just relax with friends and family. And act like a kid again while playing with my Nephew. I only manage to return to my hometown a few times a year so I always enjoy it when I get the chance, especially at this time of year. Because the climate is a little warmer then up here in Scotland. The Summer berries are in abundance at the moment in Plymouth and all along the West Country Coast. 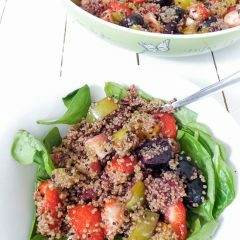 All those lovely berries I consumed were the inspiration for this lovely sweet fresh Quick Vegan Summer Fruit Quinoa Salad. This Quick Vegan Summer Fruit Quinoa Salad could pass as any meal to be honest. 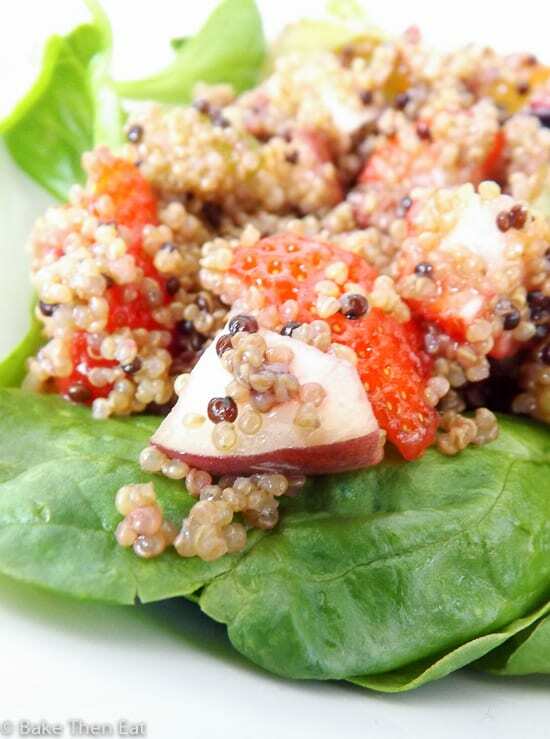 There is no reason you couldn’t enjoy this for breakfast, its super healthy and packed full of protein from the quinoa and sweetness from the fruit, and a touch of nuttiness from the dressing. It also make an awesome lunch and dinner. I think you could almost get away with this as a dessert. Almost…..
All the fruit in this dish does make this a healthy snack or meal. I used a combination of strawberries, raspberries, peach, greengages or plums can be used if you prefer. But the beauty of this dish is you can use any fruit you like. Mango would be lovely, melon would be fab and pineapple would be divine. So feel free to use whatever you have in the pantry or whatever takes your fancy. Lets talk a little about this super simple easy peasy dressing. It is just a mix of extra virgin olive oil, a touch of maple syrup for sweetness and it keeps this dish vegan as well. A teaspoon of nut butter, I used peanut butter this time as that is the one most people have. But almond or cashew will work just as well. Then a pinch of salt and pepper to bring it all together. 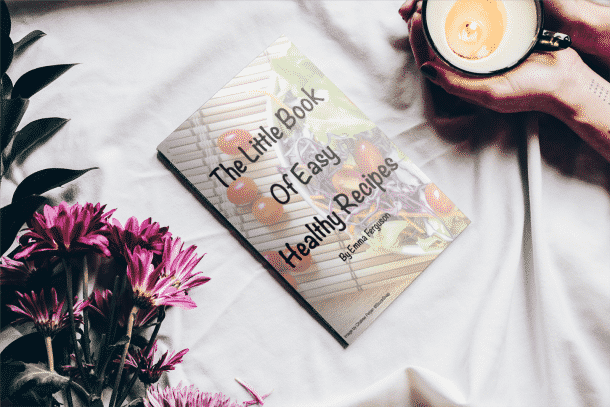 The dressing is sweet and savoury all at the same time and the nut butter makes it a little creamy as well, which pairs perfectly with the quinoa and the fruit. As I mentioned I am not long back from holiday so I shall keep this short and sweet, just like this quick vegan summer fruit quinoa salad! A great dish that is perfect as a main for 2 people or a side dish for 4. It can easily be doubled or tippled for a pot luck or a barbecue. I hope everyone else is enjoying the remainder of the summer before Autumn comes and visits us. 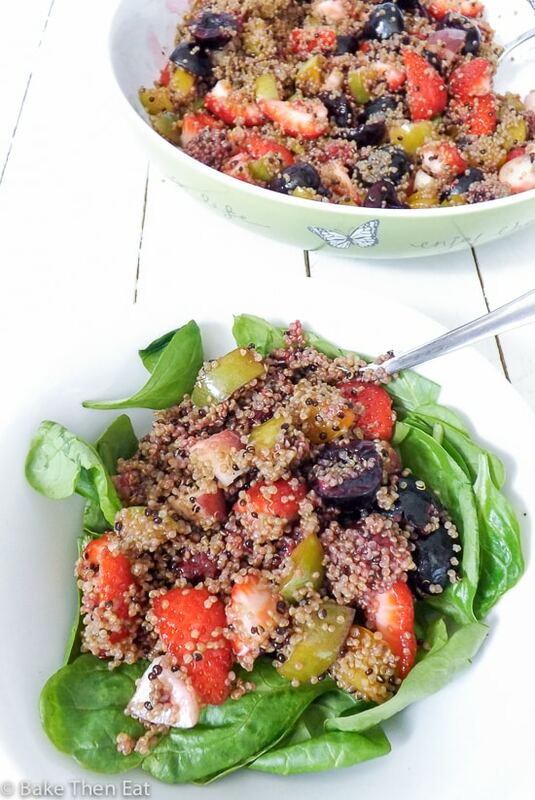 Quick Vegan Summer Fruit Quinoa Salad is an easy dish to throw together, ready in minutes. Healthy, tasty and packed gull of protein, vitamins and minerals. Perfect for snacking on or as a main meal. Was and chopped up all your fruit, then place to one side. In your serving bowl add in the cooked quinoa. Pour in the fruit and toss it in with the quinoa. Mix the extra virgin olive oil in a small container along with the maple syrup, nut butter and salt and pepper. Pour it over the quinoa and fruit and toss it all together. Kept in the fridge this dish will keep up to 3 days. I used pre cooked quinoa so I haven't taken any cooking time into account. If you are going to cook your own quinoa you will need to factor in that time. As for the amount, try about half the cooked weight - 125 grams / 1 cup uncooked quinoa. That should give you a close enough amount. 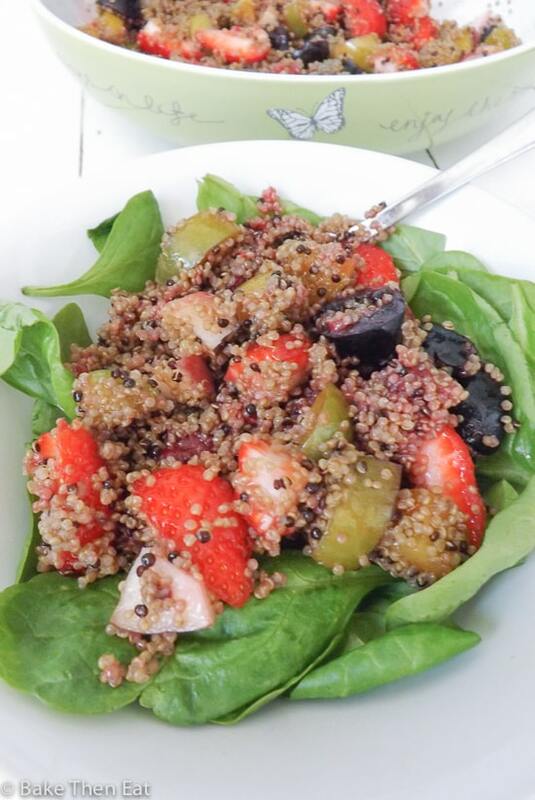 Thank you Emma for sharing this Quick Vegan Summer Fruit Quinoa Salad. As a fan of Quinoa dishes , I’ve tried it for lunch a few days ago, it’s really delicious. 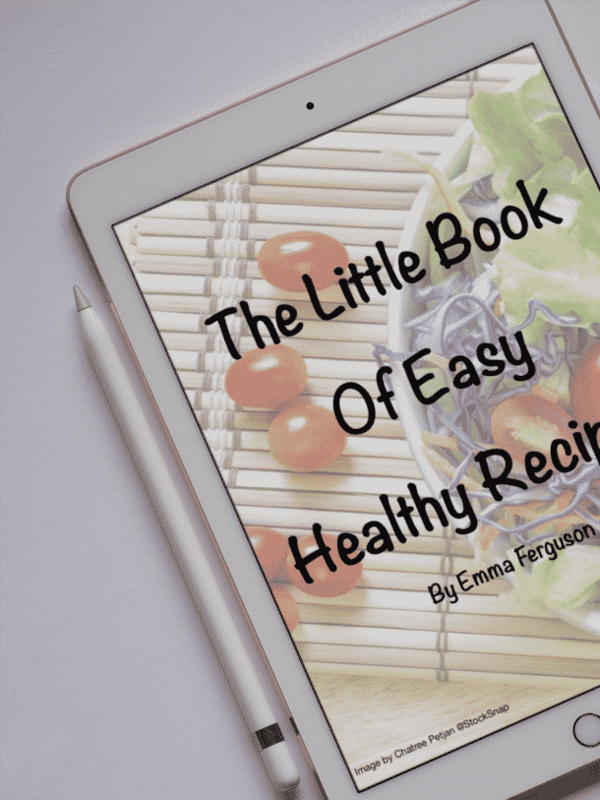 This salad seems so healthy and delicious, Emma! Perfect combination of ingredients! yum! first of all, i love maple and peanut butter together, so your dressing sounds amazing. plus, i think quinoa is so awesome and i can’t believe i’ve never incorporated it into a fruit salad! This is such an ideal summer meal! Or any time of year with other fruit 🙂 I’m a quinoa fanatic so I need to try this! Nice and healthy salad there. I like the video too. 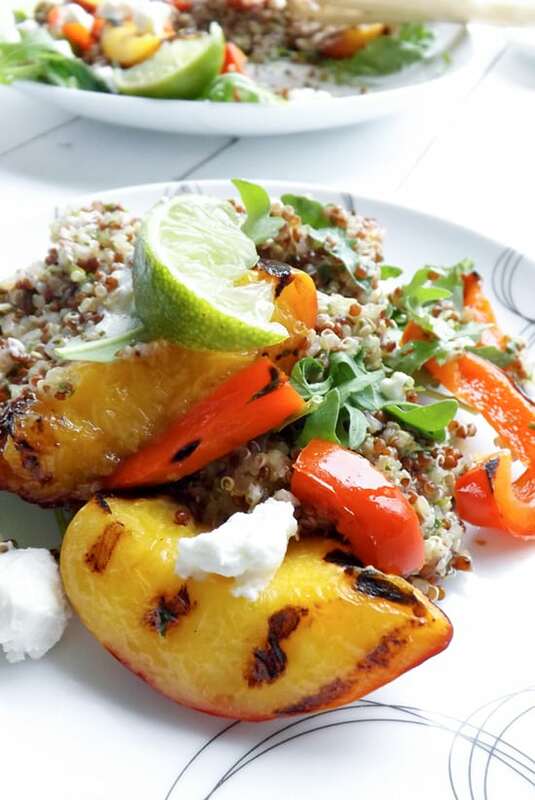 I made a yummy quinoa veggie salad a few weeks ago, and your fruit version would be a lovely alternative! I just love quinoa. 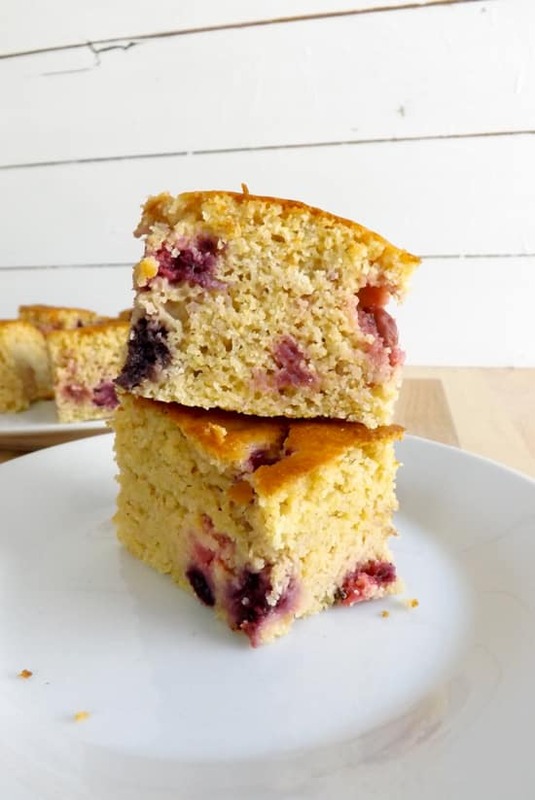 All those yummy berries must make this irresistible!!! Sound like a nice and relaxing break! The salad looks delicious – like the addition of fruit. Have a lovely weekend! I really wish I could eat quinoa because I feel like I would fall in love instantly. It looks like it has such a cool and interesting texture/mouthfeel! It is one of the nicer grains but there are others that you should be greatful you can’t eat – some are just god darn awful…. i usually make quinoa salad with a mediterranean vibe (i could never tire of olives or feta), but this sounds like a delicious way to mix things up, especially with all the great summer produce right now! Quinoa is lovely with olives and feta I often enjoy that mix for my lunches but it does make a nice change with fruit. Quick, delicious and packed with protein! I would love some too.